We now reach perhaps the most critically-acclaimed film on our countdown so far, at least at the time of its release. 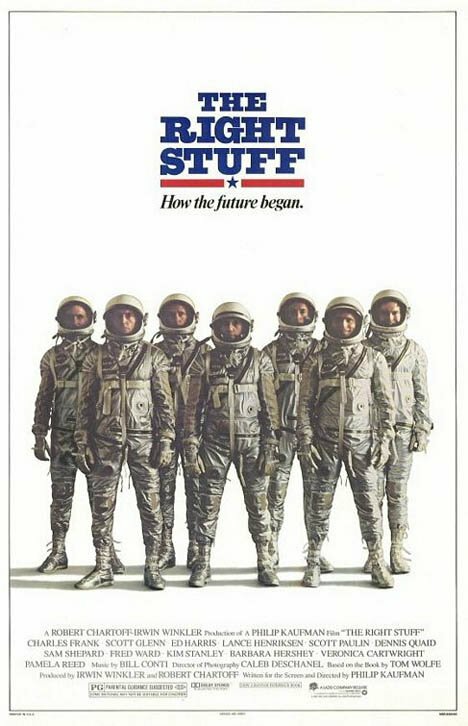 The Right Stuff, Philip Kaufman’s adaptation of the Tom Wolfe book of the same name, follows the story of the Mercury Seven, the United States’ first group of astronauts. It also features a parallel storyline following Chuck Yeager, known to most of us today as the man who broke the sound barrier but shown in this film as a man who finds himself left behind in favor of more camera-ready heroes. At the time of the film’s release, it was immediately hailed by critics as quickly as it was rejected by audiences. That’s not to say those who saw the film didn’t like it; it’s just that there weren’t many people who saw the film. A relatively expensive film with a budget of $27 million, The Right Stuff struggled to find its audience at the box office and finished with just $21.1 million in revenue (though it has made up the difference in home video revenue since then). There are a number of theories as to why the film didn’t perform well, the most far-fetched being that John Glenn‘s campaign for the Democratic presidential nomination turned off the largely conservative movie-going public from the film. I think a much more likely explanation is that audiences were turned off by the idea of a film that might be seen as somewhat critical of the American space program. The early ’80s were a time of great optimism and idealism in America, a shift in attitude from the paranoia and cynicism of the ’70s. NASA was seen then as an almost untouchable source of American pride with a near-perfect track record. Sure, there were isolated incidents here and there (including the Apollo 1 tragedy that killed Gus Grissom and two other astronauts) but the Challenger disaster was still three years away. People didn’t want to hear anything negative about the Americans who accomplished the greatest achievement in the history of mankind. But that’s not an entirely fair description of the film. Yes, Kaufman does depict the first astronauts as macho, testosterone-driven cowboys who were basically little more than daredevils during the Mercury missions. But Kaufman’s point in the end seems to be that whether you’re driving the thing or not, strapping yourself inside a tin can on top of a bomb and firing it into space still takes courage, and a kind of courage that very few of us could ever have. The superb cast that makes up those seven astronauts, their wives and the other people surrounding their lives in the space program is what truly drives the film forward. The dialogue they’re given is obvious, utilitarian and relatively trite but in the hands of most of these actors, it comes off as sincere never more so than when spoken by Ed Harris in the role of John Glenn. Harris plays Glenn as the public relations dream that NASA needed, an ‘awe shucks’ guy from the Midwest with a gleaming smile and a way with words. This scene depicting Glenn’s harrowing re-entry from orbit portrays a man who is clearly scared but knows that it’s his duty to remain optimistic in the face of danger. But (at least in the film) Glenn’s public persona wasn’t just public relations. He is also a man who cares deeply for his wife Annie, who can barely speak even with her husband due to a speech impediment. Annie is played with a heartbreaking and sincere innocence by Mary Jo Deschanel, wife of the film’s cinematographer Caleb and mother of current-day indie princess Zooey, in one of the film’s most understated and under-appreciated performances. A young Dennis Quaid provides a little levity in the film as Gordon Cooper, a sort of little brother character among the astronauts. Quaid plays up Cooper’s light-hearted nature as the man who patiently waits his turn to become the last of the Mercury Seven to reach space. Quaid was just coming off a turn in Jaws 3-D (which, believe it or not, we’ll see much, much later on our countdown) but was just on the cusp of establishing himself as the household name he would later become. His extremely likable performance in The Right Stuff is largely recognized to be the role that brought him to prominence. While there’s certainly nothing wrong with the performance that playright Sam Shepard gives as Chuck Yeager (for which he earned a Best Supporting Actor nomination), the entire arc feels very unnecessary and superfluous to me. Certainly the intent of the filmmakers here is to show that the Mercury Seven represented a new kind of American hero and a shift in the way Americans both perceived and defined heroism. It’s an interesting point, but it’s a point that’s made very early in the film and only reiterated time and again with largely uneventful scenes of Yeager looking longingly at a television or waxing poetically to his wife. The fact that the final scenes of the film serve more to resolve Yeager’s storyline than that of the Mercury Seven makes the Yeager arc even more cumbersome to the film. It’s my belief that when a film goes past the three-hour mark, there’s almost definitely something in it that’s unnecessary and unessential to telling the story. In the case of The Right Stuff, which runs a staggering 193 minutes, there are multiple unnecessary elements, some of which I could definitely do without (Yeager’s arc, numerous scenes of the wives chatting) and others that while unnecessary are legitimately entertaining (Jeff Goldblum and Harry Shearer as NASA underlings). Long though it may be, The Right Stuff at its best is superb filmmaking, loaded with great moments and performances, a heroic and emotional score from Bill Conti and a fantastic blend of archive footage and special effects shots that make the rocket launches seem as thrilling as the day they took place. Does the film mock NASA or even America for our obsessive reverence for these men? Perhaps but at the same time it notes that while these men may not have been exactly what the American people believed them to be, they still actually accomplished their acts of heroism and the fact that they were flawed and human like the rest of us makes their actions perhaps even more astounding. Next Up: The R-Rated teen comedy Class starring Rob Lowe and John Cusack.